Need some functional and handy tray? Get a TV tray set. TV tables are simple and versatile. From casual sofa-side dinners to extra serving space to a place to play solitaire, their uses seems almost endless. Great for laptop viewing, relaxing watching football, providing extra dining or working surface, TV trays set is a great investment. Featuring distinctive look with sturdy wood construction, the Linon Home Decor Tray Table Set makes a true home furnishings staple. This set includes foldable TV trays and one storage stand. The top of the stand comes with a handle making it easy to transport the entire set from one room to another. The elegance in the color will blend and fit in gorgeously with your decor. Set in stand is 19″w x 13″d x 31″h. Individual tray (open) is 19″ Wide x 1575″ Deep x 2625″ High. If you are looking for something sturdy, well made and durable offer extra dining or working surface, then you will be pleased with the Winsome Wood TV Table Set. Constructed of solid Beachwood with warm walnut finish, this set is not only solid and sturdy, but attractive enough to fit any decor. These TV trays are versatile. You can use them for entertaining or everyday. Set comes with four tables and one storage rack. 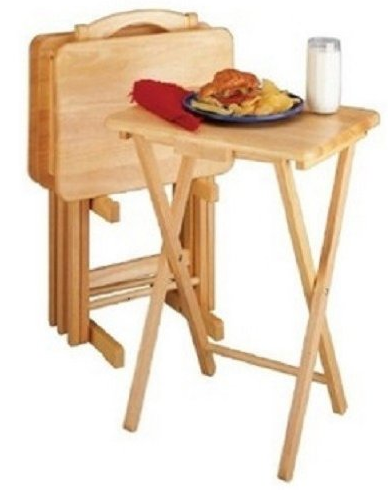 Sturdy, quality and easy to assemble, this 5 Piece TV Tray Snack Dinner Folding Table Set is a great option for anyone who is looking for a well made set. 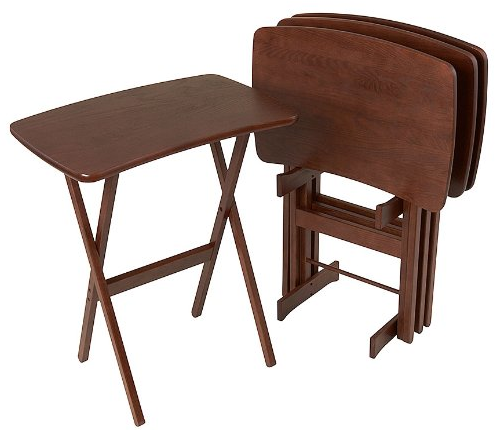 The set includes 4 tray tables and 1 stand. The wooden tray tables are functional and versatile, you can use them in front of the TV or anywhere a table top is needed. 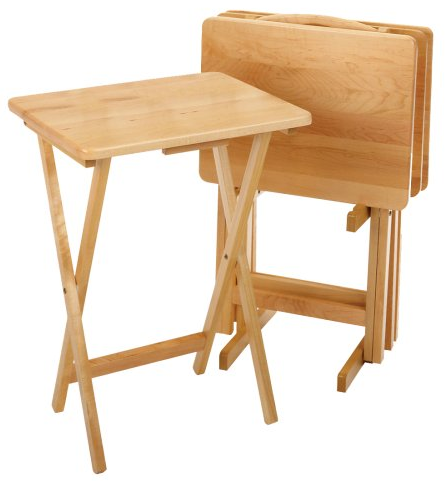 In addition, tables stack neatly into a matching sturdy stand for convenient storage. Crafted of solid beechwood with a richly grained natural finish, the Winsome Wood 5-Piece TV Table Set is an attractive and functional addition to your living room. This set includes 4 folding TV tables and matching storage stand. 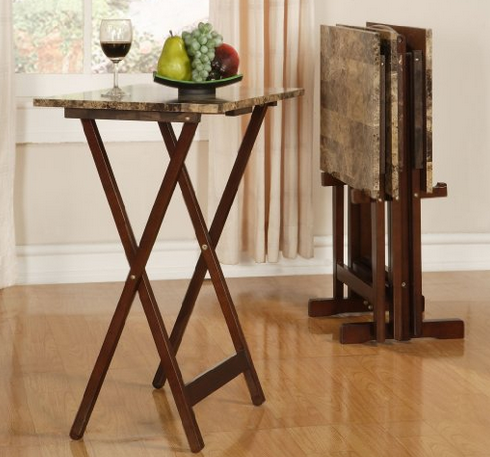 The solid wood TV Tables with smooth, broad tops can easily hold a large meal. They store flat on their matching stand that features notched arms to keep the surfaces from knocking together. Top handle on stand for easy transport. 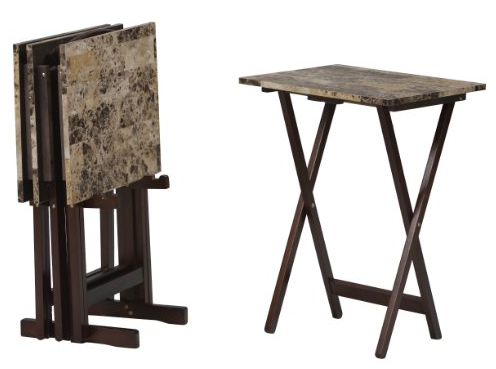 Add both style and convenience to your home with this set of 4 Contemporary Folding TV Tray Table. Made of solid Ash hardwood, this TV tray tables are looks great and durable. 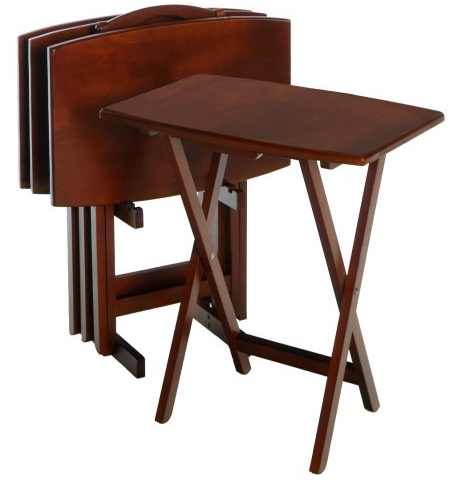 great for enjoying dinner while watching TV or playing a card game, this solid wood Contemporary Folding TV Tray Table Set make a great addition to any home. Table Size: 22.5″W x 15.25″D x 25.75″H.